For further information click anywhere on this image. Procurement procedures must ensure that all designs tendered from Requests for Quotations for equipment destined to be used in the production of a controlled product are subjected to the rigors of Design Qualification analysis. In a similar manner; any “off-the-shelf” items being considered, must be subjected to a similar analysis to verify that their existing design specification is equal to; or better than, the required design specification. A Design Qualification protocol is used at the stage where a design that has been developed from the, VMP / URS /GAMP 5 / cGMP / and other Health and Safety Guidelines, is reviewed and documented by competent persons to ensure that the designed equipment, if built, will satisfy all the detailed specified requirements, as contained in the VP and URS. I have written before in these documents that certain things are critical, well here we are again. You have taken great trouble to write, and have approved, a URS and a VP, now a vendor (or could be in house) has come forward and presented a design that they have prepared, and they state it will satisfy your requirements. This is where the majority of major project problems are manufactured, not obvious immediately, but materializing later in the project time line. The Design Qualification is the only document that is going to confirm that the design will work. It must be authored and executed by suitably qualified persons who are knowledgeable enough to challenge the proposed design and its performance. If you have no such persons on your staff you must contract them in, or contract the authoring of the Design Validation protocol out. When I arrive on site to manage a project, my very first task is always to get to grip with the design, get all the drawings and review them. I do this because thirty years of experience has made me very aware, that I need to know the design is good. So often this is not the case, and very often there are glaring abnormalities. When these are highlighted with the client and their vendors, only the vendors are smiling. The client had accepted the design and the vendor had quoted for that design, any changes will be extra to the quoted price. Sometimes this has run into seven figures. A PROPER DESIGN QUALIFICATION IS ESSENTIAL TO YOUR HEALTH. A Design Validation Protocol can also be used where a company has prepared a User Requirements Specification (URS) for a piece of equipment and is searching for a manufacturer, but is offered equipment Of - The - Shelf. A Design validation protocol can be used to verify whether the off-the-shelf item will fully deliver the functionality detailed in the URS, and conform to the requirements specified in the VMP / cGMP while complying with all applicable Health and Safety Notices. Verification that the design will achieve the URS requirements. 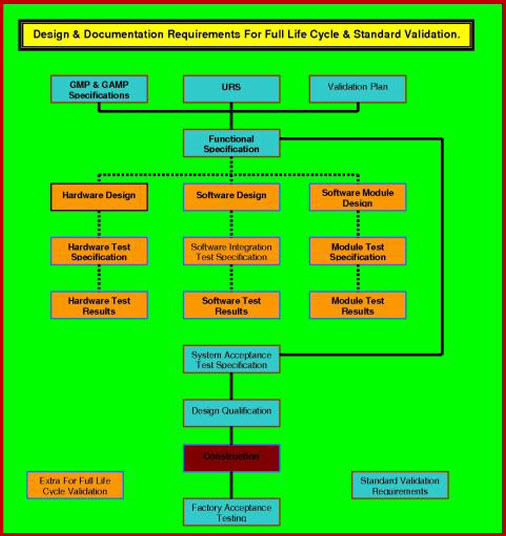 Verification that the design is cGMP compliant, and where software is used , conforms to the life cycle model requested in the VP and detailed in GAMP 5. Verification that the design complies with the VMP. Verification that the utility services required are available and validated. Verification that all the required support documentation is specified. Verification that the system will be maintainable. Verification of operation staff training requirements. Verification that the system will operate in a manner safe to both product and staff. Verification that the system conforms to all applicable national standards and guidelines. DQ in the Validation Process.